Stuffed mushrooms are a favourite of the Living Lou kitchen, I’ve shared a couple of recipes over the years (this cranberry recipe is a favourite). This recipe came together because I’ve been on a five-ingredient kick these days and love the challenge of developing these kinds of recipes. If you’ve been reading for a while, you know that I’m all about simple and flavourful recipes with minimal ingredients (this recipe has only five ingredients). I really don’t think it gets any better. 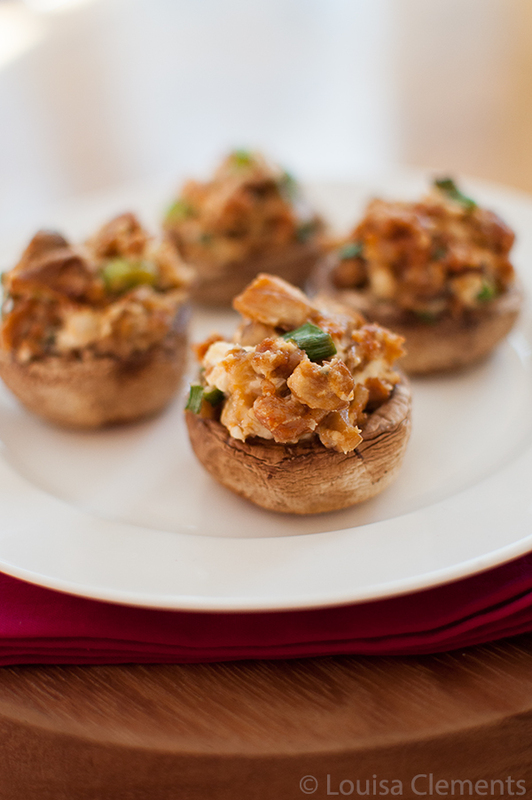 These stuffed mushrooms make for simple and easy entertaining, which is something that I think most of us are looking for if we’re having people over. This recipe may not be the healthiest, but it is packed with flavour from Italian sausages, garlic, goats cheese and green onions which, when it comes down to it, are basically all the flavours and ingredients you need in a stuffed mushroom. This is a go-to recipe for entertaining because it comes together so quickly and trust me, everyone will love them and beg for the recipe. They will then be completely floored when they realize how simple it is. I want to switch gears for a moment away from these stuffed mushrooms and talk a bit about blogging seeing as this is something I spend a lot of my time doing. Knowing that there are actually people out there reading my words can be a little daunting at times. When I first started writing here, there was no one reading and I was just putting my words out into the ether hoping that someone was reading and connecting with them. Or at the least, trying my recipes. It’s not something that I usually think about when I’m writing, but every now and then, a thought will creep into my mind that maybe you are reading this, or him or her. I think that showing vulnerability, while being inherently human, and something that connects us all, is pretty challenging to talk or write about openly. Maybe that’s because as a 20 year old, and in this age of the Facebook and Instagram “curated life” (of which I think we are all somewhat guilty), sharing your fears and hopes and those messy, stumbling moments of life just doesn’t really fit in. But I find that it is those moments and those stories that are the most important – it’s kind of what connects us all, is it not? That’s just something I’ve been thinking about recently because we all have hopes and fears. I’ve talked about some of my hopes being dashed before, but I’m definitely guilty of only sharing mostly the good moments, the “highlight reel” as they call it, on Instagram and on my blog because a lot of the time the other, messier moments are not only more difficult to talk about, but they also tend to involve other people and no one in my life signed up to be mentioned on here. And I think it’s incredibly important to protect the privacy of the people in my life. Anyways, just a few thoughts for your Sunday – would love to hear what you think about this. And now, the recipe for these rich and creamy five ingredient stuffed mushrooms. With just five ingredients, these rich and creamy stuffed mushrooms come together in just minutes and are the perfect appetizer for entertaining. Rich and creamy stuffed mushrooms made with only 5 ingredients makes for simple and impressive entertaining. Line a baking sheet with parchment paper. Place mushroom caps, stem side down on a baking sheet and bake in the oven for 10 minutes. Meanwhile, in a pan over medium heat, crumble sausage for 5 minutes. Add in chopped mushroom stems, cook for another 3 minutes. Add in garlic, and cook for another minute. Remove from heat, and stir in goats cheese and green onions. Drain liquid from roasted mushroom caps, and stuff with the filling mixture. Thanks, Natalie! 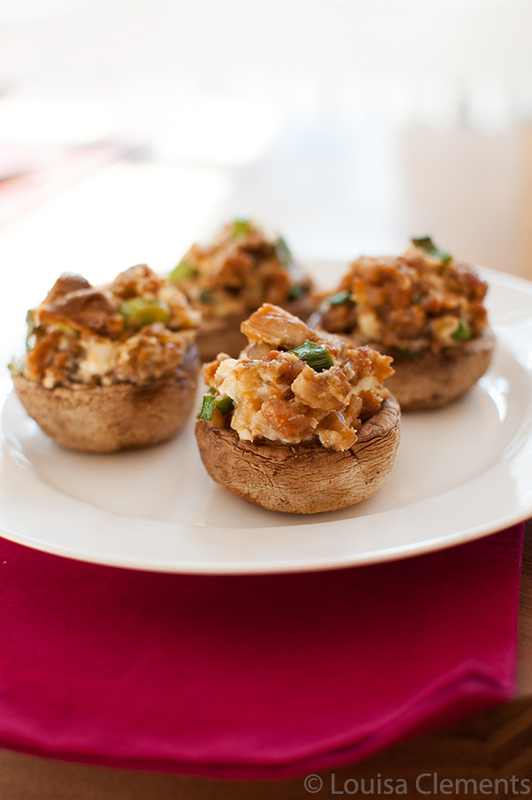 Stuffed mushrooms are one of my favourites for entertaining! Yum! These look so delicious! I bet the goat cheese is a really wonderful addition to the filling! Thanks, Kelly! The goat cheese definitely adds a nice richness to the mushrooms. I was very excited to see that no breadcrumbs were involved!